Was watching Spider Man II last nite at Jurong Point GV. Spider Man's dad Researcher Mr Richard Parker records a video message to explain his disappearance. Later, he & his wife, Mary, are aboard a private jet hijacked by a man sent to murder Richard. With the pilot dead, the plane crashes. Richard's son Peter carry on to fight crime as Spider-Man. He pursues and apprehends Aleksei Sytsevich, who attempted to steal a truck containing plutonium vials. During the chase, Spider-Man rescues OsCorp Industries employee Max Dillon. While speaking via phone with his girlfriend Gwen Stacy, Peter sees a vision of her father, police captain George Stacy, reminding him to leave Gwen out of it. Afterward, Peter meets with Gwen at their high school graduation ceremony, but insists he needs to keep his vow to her father and ends their relationship. Peter's childhood friend Harry Osborn returns to Manhattan to see his terminally ill father Norman, CEO of OsCorp. Norman explains his illness is hereditary, and Harry is at the age where it first develops. Norman gives Harry a small device he claims contains his life's work. The next day, Norman dies and Harry is appointed the new OsCorp CEO. He humiliates the OsCorp board, which has been privy to Norman's secret biogenetic projects for foreign military powers. Thinking that they have become friends, Max idolizes Spider-Man. While tending to some maintenance in an OsCorp laboratory, he loses his balance and falls into a tank of genetically modified electric eels. They attack him, and he mutates into a living electric generator. Meanwhile, Peter attempts to maintain a friendship with Gwen, but she reveals she may move to England for school. Before they can discuss it, Max wanders into Times Square and accidentally causes a blackout. Spider-Man attempts to calm him down, but the police fire at Max, making him lose his temper and attack. Spider-Man eventually stops him, and Max is taken to Ravencroft Institute. The first symptoms of Harry's illness show, and he uses the device Norman gave him to deduce that Spider-Man's blood could help save him. He asks Peter, who has been selling photos of Spider-Man to the Daily Bugle, for help finding Spider-Man. Peter refuses, unsure of what effects the transfusion would have. The OsCorp board-members frame Harry for covering up Max's accident, and remove him as CEO. Harry's assistant, Felicia, informs him of equipment that could help him, so he makes a deal with Max (now calling himself Electro) to get him back inside the OsCorp building. There he finds a suit of armor and other equipment made by Norman, as well as venom from the now-destroyed genetically altered spiders. Instead of curing him, they transform him into a hideous, goblin-like creature. Peter uses information left by his father to locate the video message in an abandoned subway station's hidden lab. Richard explains he had to leave because he refused to cooperate with Norman Osborn's biogenetic weaponization plans. Peter then hears a voicemail from Gwen, telling him she was offered the scholarship in England and is heading to the airport earlier than expected. He manages to catch her and professes his love for her, and they agree to go to England together. Electro causes another blackout, and Peter heads off to fight him. Gwen follows, and together they restore power and overload Electro's body, killing him. Afterward, the transformed Harry arrives equipped with Norman's armor and weaponry; upon seeing Gwen, Harry deduces Spider-Man's true identity and, swearing revenge for being refused the blood transfusion, kidnaps her. 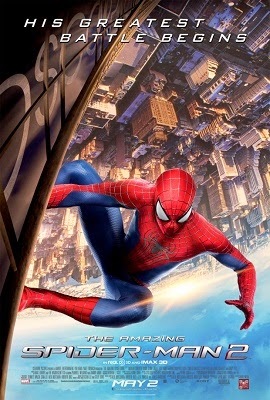 He fights Spider-Man at the top of a clock tower. Spider-Man subdues Harry, but Gwen dies, despite Spider-Man's attempt to save her. Five months later, Peter has given up being Spider-Man and often visits Gwen's grave. Harry is healing from his transformations, and his associate Gustav Fiers (the "man in the shadows" from the first film) breaks Sytsevich out of prison and equips him with an electromechanical suit of armor. Calling himself the Rhino, he rampages through the streets. But a recording of Gwen's graduation speech inspires Peter to return as Spider-Man and fight him. Andrew Garfield as Spider-Man / Peter Parker: An orphaned teenage boy who received amazing spider-powers after being bitten by a genetically altered spider. Peter first uses his powers to try to hunt down the killer of his uncle in The Amazing Spider-Man but soon decides to use his powers to fight crime as the vigilante known as Spider-Man. Garfield explained that the suit that he would wear in the film would undergo a new design. Garfield hoped to bring back the theme of him being an orphan stating, "I wanna keep exploring that theme of being fatherless, being motherless, searching for purpose and finding a purpose within himself". He felt that it was a responsibility to take on the role and that he does not take it lightly. Max Charles also reprises his role as Young Peter Parker. Emma Stone as Gwen Stacy: A high school student and Peter's love interest. When asked about Peter and Gwen's relationship in the sequel, Stone said, "She saves him more than he saves her. She's incredibly helpful to Spider-Man... He's the muscle, she's the brains." Jamie Foxx as Electro / Max Dillon: An electrical engineer who works for Oscorp Industries. Foxx described the character as "a nobody" who initially idolizes Spider-Man. He develops an obsession with Spider-Man after being saved by him and obtains his powers through an accident at Oscorp involving electric eels. Dane DeHaan as Green Goblin / Harry Osborn: An old friend of Peter and son of Norman Osborn. He was sent away to boarding school around the same time Peter's parents disappeared, and meets him for the first time since then in the film. He eventually assumes the role of the Green Goblin. Colm Feore as Donald Menken: A member of the Oscorp board. Felicity Jones as Felicia: Harry's assistant. Paul Giamatti as Rhino / Aleksei Sytsevich: Giamatti said of his character, "He’s a Russian mobster. Russians are always good villains. I have an ability to just destroy things,” he said. "My accent is pretty hammy. I loved doing it. It seemed to me like an opportunity to be as over-the-top hammy as possible. It was really fun." Sally Field as Aunt May: Peter's aunt. Marton Csokas as Dr. Ashley Kafka: The head of Ravencroft Institute. Chris Cooper portrays Norman Osborn, the president of Oscorp and Harry Osborn's father, while B. J. Novak portrays Alistair Smythe. Denis Leary reprises his role as George Stacy from the first film. Spider-Man co-creator Stan Lee has a cameo appearance as a guest at Peter and Gwen's graduation ceremony. Michael Massee reprises his role as the Man in the Shadows from the first film, with the character now credited as "Gustav Fiers (The Gentleman)."